This litlte piggy went to the Big Apple Barbecue Block Party. 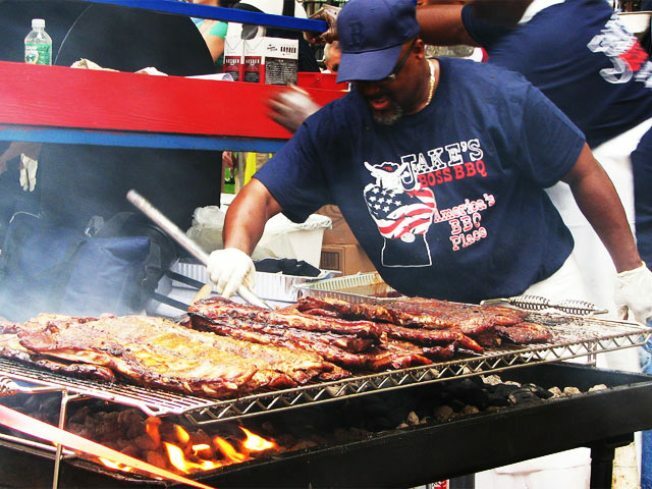 AVENUE Q: This weekend, the Big Apple Barbecue Block Party (hosted by Danny Meyer and Blue Smoke's Kenny Callaghan) returns to MadisonSquarePark, featuring 17 champion Qers, plus live music and much more. Veterans know that’s a lot of smoked, grilled and slathered meat to navigate in just a few hours, so don’t miss pitmaster Chris Lilly’s tips on spending the least amount of time in line. Saturday and Sunday, 11AM-6PM. LAST CALL: “Graphic Heroes, Magic Monsters” ends this Sunday at the Japan Society: Don’t miss this exhibit of 100+ works by 19th-century artist Utagawa Kuniyoshi, whose often violent, fantastical illustrations are seen as the defining influence of manga and anime. Saturday and Sunday, 11AM-5PM. PR PRIDE: It’s just you and 2 million other revelers lining the Fifth Avenue route of the National Puerto Rican Day Parade, stretching from 44th to 86th Streets. Sunday, 11AM. ISLAND CULTURE: Governor’s Island turns into a veritable funhouse of art this weekend, as 400+ interactive displays, installations and other projects pop up on the swath of land. Figment 2010 runs Friday through Sunday, schedule varies.